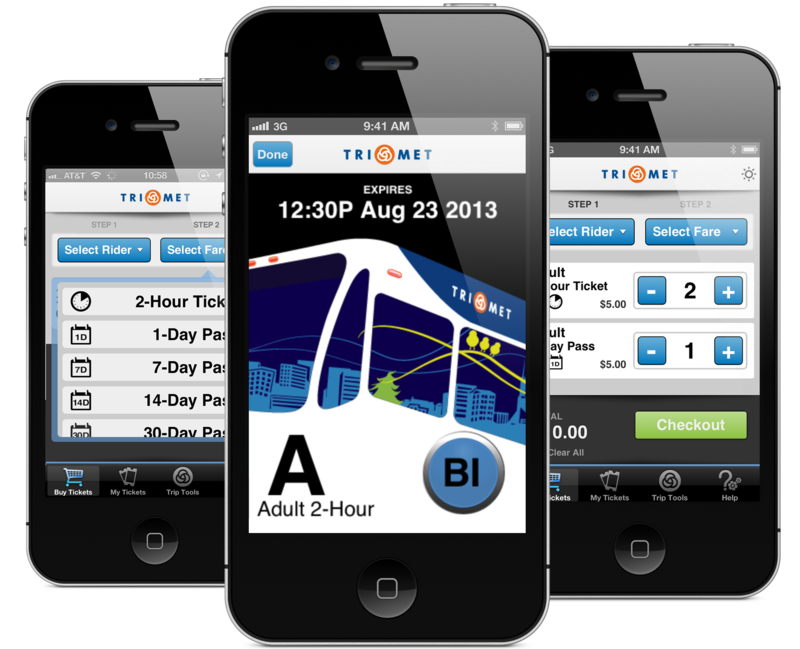 TriMet makes riding transit easier with today’s release of the TriMet Tickets mobile ticketing app. The innovative app makes our riders the first in the U.S. to use a mobile ticketing app to ride both buses and trains. TriMet paid no upfront costs for the development of the TriMet Tickets app. The mobile ticketing app will save the agency money by reducing the operating costs associated with printed and cash fares. The app also brings TriMet one step closer to a state-of-the-art electronic fare collection system that will eventually provide all riders – not just those with smartphones – with easy and convenient ways to pay their fare. We will begin testing an eFare system as early as fall 2015. Learn more about eFares. With the TriMet Tickets app, riding has never been easier. 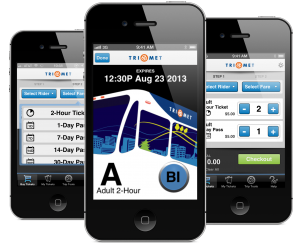 Just go to your Apple or Android app store and search for TriMet Tickets. Download the free app and register your debit or credit card into the secure system. You’ll be taken to the “My Tickets” tab. Tap “Use” and you are ready to ride. The app lets you choose a single fare or multiple fares for a group of riders. You can also purchase tickets on any computer via our website for use in the app. The TriMet Tickets mobile fares are accepted on TriMet buses, MAX trains, WES Commuter Rail and the Portland Streetcar. Start your app before you arrive at your stop. Before entering a MAX platform where fares are required, go to the “My Tickets” tab and press “Use” to validate your ticket, otherwise wait until you see your bus or train approaching and then tap “Use”. Show your phone screen to the bus operator when boarding or when requested by TriMet personnel or Transit Police officers. No more searching for exact change; no more extra stops to purchase your fare; no paper ticket to keep track of. It’s all right there in the palm of your hand. The mobile tickets are animated, with the expiration date, fare type, and the correct day code. TriMet personnel may ask you to verify your ticket by tapping on any of the windows of the bus. This turns on the lights inside the bus, demonstrating the animated ticket is not a video recording of a valid ticket. TriMet personnel may also ask you to confirm your ticket is authentic by launching the unique QR code embedded in each ticket. Display that by tapping the blue button in the bottom right corner of the ticket. The QR code can then be scanned using a fare enforcement application and the ticket is verified within seconds. The code contains pertinent data regarding scan status, time, ticket type and location. Don’t wait until you see a fare inspector to launch your ticket – you must validate your ticket before boarding. The expiration date/time flashes for the first four minutes after a ticket has been activated, providing inspectors with a clear visual indicator when tickets were validated. A minimum of $5 purchase is required. You can buy two Adult 2-Hour tickets and activate them individually or get a Day Pass. It’s a great value that gives you unlimited rides throughout the system for the day. Don’t let your phone battery die if you are going to be riding. You should expect to purchase a paper ticket if that happens as you are responsible for showing proof of a valid fare. Same is true if you lose your smartphone. Expect to purchase a paper ticket until you have your phone back. Heading down to the Washington Park MAX platform? Fares are required on the platform so be sure to not only purchase your ticket before you get into the elevator, but validate it as well. A network or wireless connection is needed to buy tickets via the mobile app anyway, and there is no such connection down in the tunnel. Once tickets are purchased, they are stored on your smartphone, but if you wait on the Washington Park platform until you hear the train approaching to press “Use” on the ticket you face a citation or exclusion. You can also use your TriMet Tickets mobile app to plan trips, check next arrival times, get notifications and service updates.